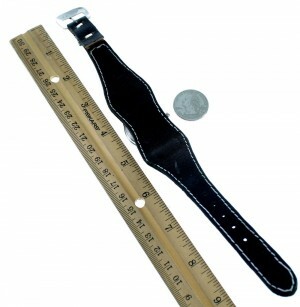 Watch measures 1-1/4" wide and inside circumference measures approximately 6-1/2" and is adjustable up to 7-3/4" which means the watch will fit a wrist that is 5-1/2" to 7-1/2" comfortably. 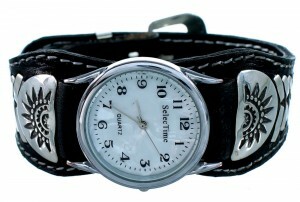 Excellent craftsmanship is shown throughout this amazing watch! 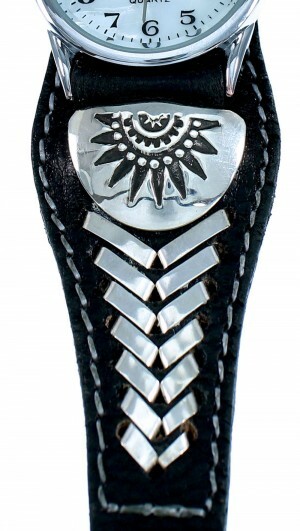 This piece of Native American jewelry is Navajo hand crafted by artist Frank Armstrong, out of genuine sterling silver and leather. 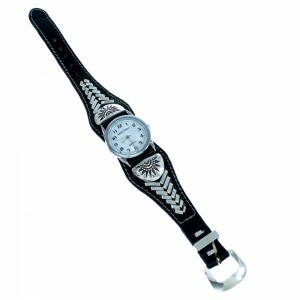 Imprinted designs and hand crafted silverwork complete the wtach to perfection.